Well we all survived the MAMA Awards and a few surprises as usual. Gallo Center for the Arts was voted the best venue to see live music at to many of the audience’s surprise. The Gallo, although a state of the art venue that caters to a select demographic of Modesto, is not the blue collar MAMA audience demographic. The gentleman accepting the award made promises of having morelocal acts at the Gallo in the future which is good news and would be good for our local music scene. Hope it happens. Marirose & the Gypsies who won the event to open for the Michael McDonald Gallo show is the only local act to grace the stage of the Gallo so far. Well the Gallo has a glossy email send out to their people and anyone can vote for their favorite MAMA category, that’s democracy and the power of social networking in America folks. Tom Waits said, “The big line giveth and the small line taketh away.” While we’re on the subject, the promotional board at the State Theatre has embraced local promoters like myself in the area to give input into programming at the State. The hope for me and other promoters is for the State to align themselves with the grassroots community of artists and musicians to keep the State healthy and our art community area as well. On the rumor mill: no, Salty’s Record Attic is not closing. Owner Ramona Sabin is back at work and doing better so come down and check her out. Jim DeNoon owner of Buck’s Music is closing and liquidating all stock so he can get back to Las Vegas where his family and livelihood are. 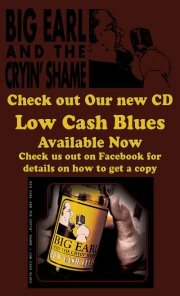 And yes Big Earl & the Cryin’ Shame have finally got a CD out with release party November 12th at the Season’s on McHenry Avenue. The event will feature the band and many special guests throughout the night. I’ve heard the CD and it’s smoking with mixing and production by Lucky Lou arguably the best sound engineer in Modesto. Check out Earl at: BigEarl@gmail.com , or Facebook.com. The State Theatre continues to bring in some quality shows, the Flying Blind Reunion street party was smoking with great music and good turnout. The State has booked so far: Elvin Bishop Nov. 11th, The Tommy Castro BandDec. 9th, and Tower of Power Dec. 29th, and there is noise being made that the State may start having a dance floor for some of these shows where it is cruel and unusual punishment sitting in your seats all night long doing the bar stool boogie. Call the State (209) 527-4697, or check out www.thestate.org for the lowdown. And the mighty John Griswold of Global Music Series finished out the season at the Whitmore Mansion on Oct. 8th with Jazz guitarist Richard Smith, and Classical and Flamenco guitarist Franscesco Buzzurro’s playing. John is singing the swan song again with promises of no more shows, however he wants all of us to use his web site which promotes events in the area. So check John out at http://www.eArtsnews.com. Although we have lost a major dynamo for live music at the Barkin’ Dog Grill, Ernie Bucio, the band plays on supporting live music in an all-age environment. John Black of JB Presents continues to bring in smoking local and regional R & B acts. November 5th, Red Dog Ash, 12th Big Little Band, 16th Second Tradition Band, 18th Roger Perry Band, and 19th my home boy, Big Earl & the Cryin’ Shame, (I love that name!). 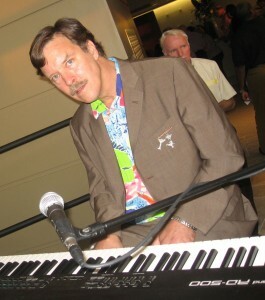 The Barkin’ Dog also has a Jazz Jam with David Dow on Thursdays where musicians can sit in and network. More music on the local scene. Camp 4 Wine Café Wednesdays with Scott Bartenhagen. Chef’s of New York singing great Cathy Canales on Saturdays. GallettoRistorante Fridays, Saturdays with Natalia on the grand piano & sultry vocals cocktail hours. The Deva Café has Thursday night Ramble with house band Big Earl & Poorhouse Millionaires hosting an acoustic jam with 2 bands featured per week. And don’t forget third Thursdays Art Walk in the downtown, lots of music and art going on and is really festive. The Boardroom in the downtown continues to support live music 4 nights a week with Tim Allen Tuesdays, Thursdays Neil Buettner and Matt Harrington, Friday’s dynamic duo Johnny & Kelly, and Saturdays rotate with: MCW Band, Strange Brew, The Nines, & Public Domain. Dress code weekends so call so you don’t offend, (209) 409-8665 for details. Off the beaten path: the Clarion Hotel & Shooters on Sisk road have comedy Mondays, Salsa dance lessons Tuesdays, Wednesdays with the Creole Jazz Kings. And the St. Claire Theatre on 7th Street featuring Saturday comedy shows in an intimate theatre environment with bar and food available. Sips Bistro and Wine shop also features Jazz and popular music in a casual setting Sunday afternoons from 6:00 to 9:00 p.m. with food and wine tasting. Regulars on the music menu are: Jazzoni, Michele Richardson, and Dave Bagget. 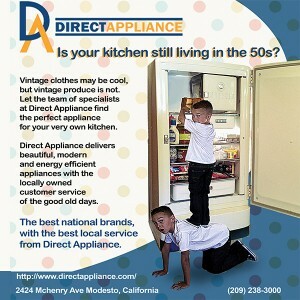 Call Diana for more details at (209) 527-7477. The West Side Theatre in Newman continues with an eclectic lineup in a restoredtheatre environment. The calendar: Nov. 5th Evolution, (ultimateJourney tribute band), Nov. 11th HAPA, the music of Maui, 12th Blame Sally, and Nov. 19th Magnolia. For more info Check out: www.westsidetheatre.org, or call (209) 862-4490. And one final thought; some venues not normally doing live music, myself and others are conspiring to do monthly house parties, or as was known in the Jazz era“rent parties” to keep the music flowing. So please call or contact me if you want to be a coconspirator. I encourage all of you to send me your info and I will send it out on weekly email and in the Modesto View. Hit me at: mbenson@fire2wire.com, or give me a holler at (209) 918-7033.